This digital stamp is still available for free to colour. 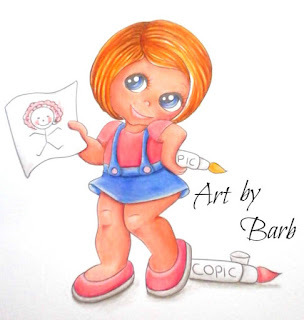 Visit Art by Barb group to collect a copy. My daughter is the inspiration for most of my art work! She is now 21 years old, but my gosh she was a little madam as a child: not naughty, just a mischievous hand full! Her childhood antics drove me up the wall but now they bring great joy and I try to capture these memories in my artwork! I didn't colour when she was a child, but if she was a child today then I just know this is something that she'd do, use my bestest markers to draw me a pic to say sorry for using my markers that I'd warned her not to use! Hence the reason I named the image "Oops sorry ma!" Who am I kidding, she's just as bad now. Once at a car boot sale, she promised a fellow crafter to sell her all my markers because she'd not seen me using them for a while! Good job I went with her the following week and intercepted that little transaction. I was gobsmacked when this woman approached me to ask if I was the colouring lady and did I have my markers to hand?!! !